Google Apps is growing by leaps and bounds. There are 6MM organizations on Google Apps (now refered to as G Suite) and over 60MM users. In a few short years, Google Apps has supplanted Microsoft Exchange as a significant player in the email space. Google software solutions such as docs, sheets, and others are taking a big bite out of the Microsoft Office suite as well. The revolution isn’t fueled by the fact that Google’s software is less expensive than Microsoft’s. Google’s product is just better for many organizations. G Suite is more efficient and collaborative by being immediately available and shareable on a variety of devices, from anywhere. Why even open Microsoft Word when you can just hop on Google Docs? Organizations should be leveraging Google Apps, but they must do so wisely. There are existing services and best practices that can make this a breeze, but you first must be acquainted with the challenges. Exchange is Microsoft only. Meanwhile, most organizations are moving to anything but (Mac, Linux, Mobile). So many CEOs see getting rid of Exchange in exchange for G Suite as a welcome opportunity. Many startups are bypassing on-premises infrastructure altogether in favor of the cloud. The challenge comes in when organizations think about the identity side of the equation. Microsoft Active Directory® is the old standby, but it has the same problems as Exchange. If Exchange is being replaced by Google Apps, then why would organizations still want to go with AD? The answer for most organizations is: they don’t. What they want is for Google Apps to function as their identity provider. But unfortunately those capabilities aren’t within Google Apps. In July 2015, Bloomberg Business reported that JumpCloud announced it’s Google Apps integration, allowing JumpCloud to become the primary identity provider to Google Apps. The gap between Google Apps and directory services has been bridged. Sign-up for JumpCloud and let us automatically connect to your Google Apps account (you’ll need a superadmin user account, with API access turned on in Google Apps to do so). Import Users – either from Google Apps or through the JumpCloud Directory-as-a-Service platform – JumpCloud serves as the organization’s authoritative directory service and as such you’ll need to populate all of your users in there. Provision, Deprovision, or Update Users in JumpCloud – any changes in JumpCloud are automatically propagated to Google Apps. Everything is instantly synchronized with centralized control. New users provisioned in JumpCloud can be automatically provisioned in Google Apps. A user that is removed from the core directory will also have their account disabled in Google Apps. A password update in JumpCloud syncs with Google Apps. With that, JumpCloud becomes the identity engine driving Google Apps for organizations. The best part about this equation is that everything is in the cloud and connected. There is no hardware or software for IT admins to manage and no complicated interconnections. 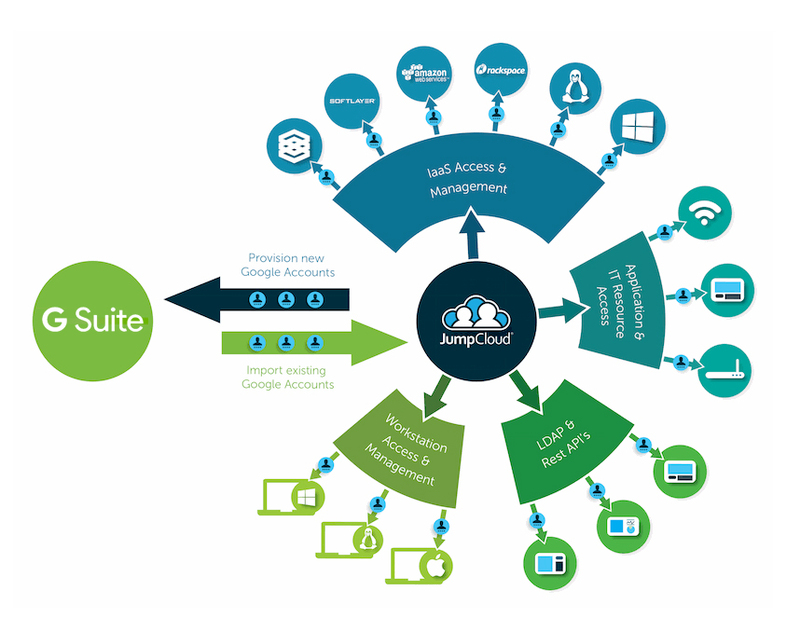 JumpCloud seamlessly operates with Google Apps through API calls. And while it automatically provisions your users in Google Apps, it won’t interfere with any other Google Apps functionality. That means your users can go on using Google Apps as they always have, only now they can use the same username and password on their own desktop as they do for Google Apps. Ready to Operate Your Business on Google Apps? If you’re a Google Apps customer and are interested in having a core identity solution connected to that platform, JumpCloud is the leading option. 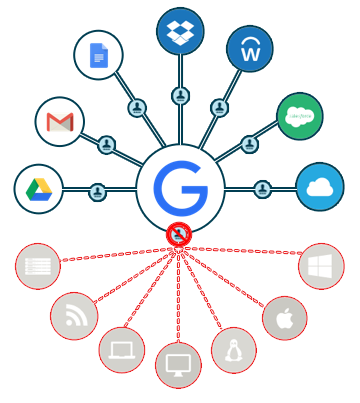 JumpCloud’s Directory-as-a-Service solution is a cloud-based directory service that tightly integrates with Google Apps to provide organizations with a central identity management platform. Drop us a note if you have any questions or feel free to just get started with a free account to begin connecting JumpCloud to Google App.